Sister Ruth Marie Penksa, GNSH, 82, died December 28, 2016 in the Erie County Medical Center (ECMC) from complications of burns suffered on December 20. A Buffalo native, she graduated from Riverside High School and received a Bachelor of Arts in Spanish from D’Youville College. Her career in education began in local area high schools where she taught Spanish for 4 years prior to entering the Grey Nuns of the Sacred Heart in 1967. With the exception of 5 years in Pennsylvania, the rest of her ministry assignments were in her home state of New York, in Corona, Eden and Buffalo. She taught at Holy Angels Academy, D’Youville College and was principal at Immaculate Conception school in Eden. She served in Parish Ministry at All Saints Parish for a year and then from 1982 to 2007 in Campus Ministry at Erie County Community College. In 1988 Sister Ruth received an Outstanding Achievement Award from Erie County Community College. 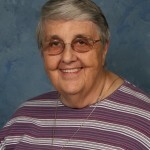 In retirement Sister Ruth continued an active volunteer presence in the Buffalo area even as health issues intervened. One of her volunteer ministries was reading books, magazines and newspapers to the blind through Niagara Frontier Radio Reading Service in Buffalo, New York. Sister Ruth was a staunch pro-life advocate who regularly participated in the National Life Chain event on Niagara Falls Boulevard and joined a local group for the March for Life in Washington, D.C. Daughter of the late Michael and Sophie (Urbaniak) Penksa, she is also predeceased by a brother, Daniel (Rose). In addition to her religious congregation she is survived by brothers Thomas (Irene) and Michael (Kathy) Penksa and nieces and nephews. Wake Service will be at the Amigone Funeral Home (1132 Delaware Avenue, Buffalo, NY) from 4 to 8 pm on Tuesday, January 3, 2017. Mass of Christian Burial at 9:30 AM on Wednesday, January 4, 2017 at Assumption Church(435 Amherst Street, Buffalo, NY) Burial immediately following in Mt. Olivet Cemetery, Tonawanda, NY., immediately following the Funeral Mass. Arrangements by Amigone Funeral Home. In lieu of flowers, memorial donations in Sister’s memory may be made online to the Grey Nuns of the Sacred Heart, or by mail at the following address:14500 Bustleton Avenue, Philadelphia, PA 19116. Sister Ruth was the Spanish Teacher at Melrose Academy while I was a student in high school there. She was smart, energetic and a FINE softball player. I am saddened hearing of her death. There will be a mass of Remembrance for Sister Ruth at All Saints RC Church 1/8/17 at 11am. We are located at 127 Chadduck st in Buffalo, NY 14207 in the Riverside area. 875-8183. Please share this information and attend this mass in honor of such a beautiful soul.